This sculpted sandstone effigy represents Rishabanatha (or Adinatha), first of the twenty- fourJain Tirthankara (ford makers). In the Jain religion, these are masters whose role is to transmit fundamental doctrinal tenets down the centuries. The Jina Rishabanatha is portrayed naked, seated on a cushion in the lotus or vajraparyankasana diamond position. 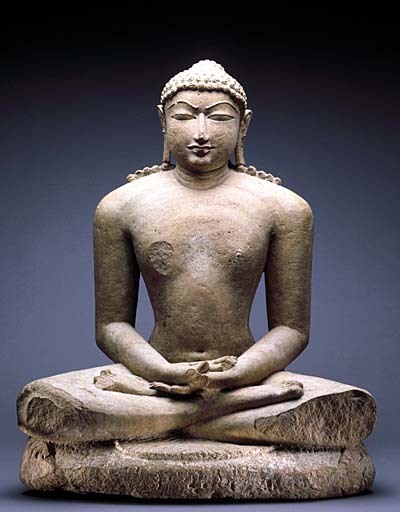 His hands are clasped in his lap, making the symbolic dhyanana mudra gesture of meditation. The stylized hair with its uniform curls, some of which fall in locks onto both shoulders, enable the Jina to be identified with absolute certainty, as the hairstyle is specific to this particular Tirthankara. Plunged in fathomless meditation, the Jina seems to have withdrawn from secular attachments and worldly contingencies. The dual prerequisites of inner purity and liberating asceticism expressed by the immobile posture and impassive features are particularly well rendered here. With supreme craftsmanship, the sculptor has succeeded in harmoniously blending the subdued iconographic canons of the Jain esthetic with the refined, yet radiant forms of medieval Indian Chandela statuary of the 11th-12th centuries. This Jina was particularly venerated by the Digambara (sky-clad) sect who dedicated three temples to his cult: Parsvanatha, Ghantai and Adinath, erected on the site of Khajuraho, the ancient capital of the Chandela dynasty. These temples house almost sixty images of Rishabanatha, occasionally represented standing entirely naked, but more often portrayed in the same attitude of meditation as seen here.